Meeting today’s environmental challenges requires a new way of thinking about the intricate dependencies between humans and nature. 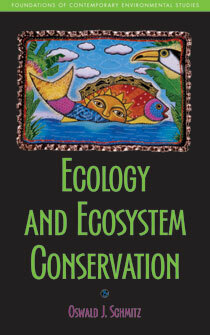 Ecology and Ecosystem Conservation provides students and other readers with a basic understanding of the fundamental principles of ecological science and their applications, offering an essential overview of the way ecology can be used to devise strategies to conserve the health and functioning of ecosystems. • What is the role of ecological science in decision making? • What factors govern the assembly of ecosystems and determine their response to various stressors? • How does Earth’s climate system function and determine the distribution of life on Earth? • What factors control the size of populations? • How does fragmentation of the landscape affect the persistence of species on the landscape? • How does biological diversity influence ecosystem processes? The book closes with a final chapter that addresses the need not only to understand ecological science, but to put that science into an ecosystem conservation ethics perspective. "Reading this book has been rewarding—there were no disappointments. Schmitz has done a credible job of presenting the complex and multifaceted field of ecology in a compact and readable book ... I believe this book is an important contribution toward a better understanding and treatment of our environment, and could be used to enlighten a larger audience of non-ecologists." "A wonderfully readable introduction to the ecological context for conservation practice. Ideal for a general readership or as the basis for an excellent university course." Simon Levin, Princeton University, author of "Fragile Dominion"
"At last, one volume seamlessly merges the dominant ecological themes of our time into a single coherent explanation of why the conservation of biodiversity and ecosystems is the key to solving today's most pressing environmental problems." "Starting from concrete examples and questions in the field of conservation biology, this book presents the principles of modern ecology in a simple form accessible to all. It is easy and enjoyable to read, while at the same time scientifically rigorous. An excellent introduction to ecology as the scientific underpinning of conservation biology."